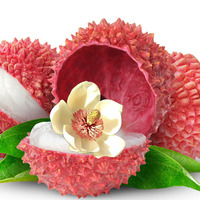 A vibrant and juicy lychee enveloping a blossom. Steep time: Can be SnV'd after a real good shake, but best after 2-3 days. Wouldn't steep it too long as the mix isn't as good when FA Red touch inevitably fades. This mix initially came about me trying to get the most out of CAP Sweet Lychee instead of opting for another brand. While CAP Sweet Lychee isn't bad at all, it has obvious drawbacks. Not very juicy, and a floral offnote. At 4% it gives a solid base to this mix, but gives you some work to do..
At 3% this just gives a pink/red background to the vape and to fill in some of the gaps Sweet Lychee leaves. At 1% this boosts the brightness and makes the mix more vibrant. The turning point in the mix. The mix was shaping up to be a nice juicy Lychee but something had to be done about those floral/perfumey notes. Instead of fighting/hiding that I decided to add Honeysuckle to embrace those notes and tuck them into a hidden flower in the vape. At 1.5% it does just enough of that while leaving the mix a mainly Lychee profile. After adding honeysuckle and changing the profile of the mix I felt like I needed another fruit to support the bottom of the flavor. Pear, commonly used as a fruit juice filler, worked perfectly and elevated the mix and gave it more dimension. Initially started at 2%, and it was good, but opted to lower it to 1.5% to let the rest of the mix come through more. Edit: Sigh I opted to up it back again to 2 from 1.5 but that is optional. Both versions are good just slightly different. If you'd prefer less lychee go for 2% otherwise drop it to 1.5%. My sweetener of choice. Just 0.75%(~3 drops per 10ml) to boost the sweetness of the fruits. Feel free to not use it but I like it more with. Edit: Sept 19th, Reverted my recipe back to the old percentages (1% Dragonfruit vs 1.5%, 2% FA Pear vs 1.5%), so back to the initial version of the recipe. This recipe is the property of Havohej and released under the CC Attribution 4.0 license. You may not copy, derive or commercialize this recipe without following the terms of this license or the explicit permission of the creator. This stuff is amazeballs. I love lychee flavors, and was intrigued by the notion of going for the floral note instead of masking it, The honeysuckle is an inspired touch. It leaves this a very light flavor in terms of texture, but it is a fully packed one. This is what tropical air should taste like if you're inland, and not surrounded by the beach. Fragrant, tasty, but not as heavy as something that leans on the fruit side of the equation. It's fruity blossom scented air, and I dig the hell out of it. This is one i'm going to be coming back to a lot this winter. I don't dare to add anything ID10-T says. Everything he said is right. It tastes like this mixer was dissatisfied by the standalone flavor of CAP Sweet Lychee, set out to add things to it to make it as good as he possibly could, and definitely succeeded. Sweet, bright, extra juicy, with a little mouthwatering tartness and fascinating floral playfulness . My favorite part is the way the lychee flavor's florality was embraced rather than covered up. Lil stroke of genius right there.